New Delhi: The Vice President of India, Shri M. Venkaiah Naidu has said that Dr. M.S. Subbulakshmi was a legendary and iconic figure who mesmerized everyone from Mahatma Gandhi to common man. He was addressing the gathering at an event to inaugurate an Exhibition on Dr. M.S. Subbulakshmi and release a Commemorative Coin on the occasion of her Birth Centenary Commemoration, here today. The Minister of State for Culture (I/C) and Environment, Forest & Climate Change, Dr. Mahesh Sharma and other dignitaries were also present on the occasion. The Vice President said that India is a land of rich cultural heritage with music in diverse genres representing the truly myriad mosaic of plurality. He further said that what defines India is this rich heritage of music and its unifying role in bringing people together cutting across religions, regions, castes and communities. 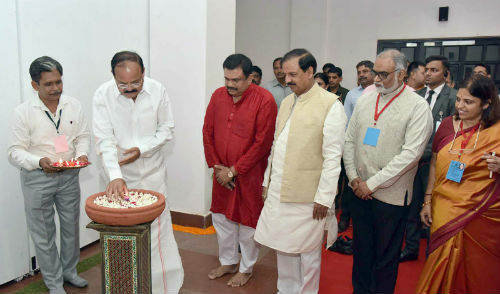 The Vice President said that the roots of Indian music can be traced to Vedic literature, Sama Veda in particular and as such every note and cadence associated with our ancient music systems have to be preserved and propagated. He further said that this is our bounden duty to see such cultural heritage is preserved which is given to us by our fore fathers and pass it on to the next generation. “India is a land of rich cultural heritage with music in diverse genres representing the truly myriad mosaic of plurality – from the two main fountainheads of classical music – Carnatic and Hindustani – to a variety of folk music from every nook and corner to Sufi music, Qawwalis, Rabindra Sangeet to popular film music. What defines India is this rich heritage of music and its unifying role in bringing people together cutting across religions, regions, castes and communities. Friends! The roots of Indian music can be traced to Vedic literature, Sama Veda in particular and as such every note and cadence associated with our ancient music systems have to be preserved and propagated. This is our bounden duty to see such cultural heritage is preserved which is given to us by our fore fathers. We have to preserve it and pass it on to the next generation. I am happy that the Indira Gandhi National Cultural Centre has taken up this responsibility and the Ministry of Culture is supporting it. I would like to compliment the Minister of Culture, Shri Mahesh Sharma for taking this initiative of celebrating Birth Centenary of this noble daughter of this country. Her music is immortal. Everyone in this country influenced and thrilled by her music. Even Mahatma Gandhi was spell-bound when he listen her rendition of ‘Vaishnav Janatho’. The first Prime Minister of India, Pt. Jawaharlal said about M.S. Subbulakshmi that ‘I am an ordinary Prime Minister in front of the Queen of Music’. The titans in the opposite sides of those days, the ideology like Pt. Jawarlal Nehru on one side and Rajaji on the other side and both of them acclaimed her great qualities and they stand together when they came to appreciate the Music from her. Music acquired a divine dimension when somebody like legendary Carnatic singer, late M S Subbulakshmi lent her voice to various compositions. It will be perhaps an understatement to say that M.S. Subbulakshmi is a well-known name not only in India but across the world. She was a cult figure, who had mesmerized everyone from Mahatma Gandhi to the common man with her mellifluous voice. Upon Gandhiji’s insistence, she recorded his favourite Meera bhajan ‘Hari Tum Haro’ overnight and sent it to him on his birthday in 1947. She was the first musician to be awarded Bharat Ratna, the country’s highest civilian honour. She was also the first Indian musician to have performed at the United Nations General Assembly and the first Indian musician to be conferred with the Ramon Magsaysay award for public service. She was called the ‘Nightingale of India’ by Sarojini Naidu and “Tapaswini” by Lata Mangeshkar, while Ustad Bade Ghulam Ali Khan described her as “Suswaralakshmi Subbulakshmi. Apart from UN, she performed at the Edinburg International Festival and for Queen Elizabeth-II at the Royal Albert Hall, London. She mostly sang in Tamil, Telugu, Kannada and Meera Bhajans in Hindi. For many decades now, it has been a common practice in most South Indian homes for people to wake up in the morning to the strains of M S Subbulakshmi’s rendition of Bhaja Govindam, the popular devotional composition written by Jagadguru Adi Shankaracharya, Vishnu Sahasranaamam and Sri Venkateswara Suprabhatam, among others. Her Venkateswara Suprabhatham is played in Tirumala temple daily as part of the ritual. She also made a huge contribution to popularizing Annanmacharya Kritis. She also undertook more than 200 charity concerts and donated the royalties she had earned on devotional albums to the Tirumala temple.